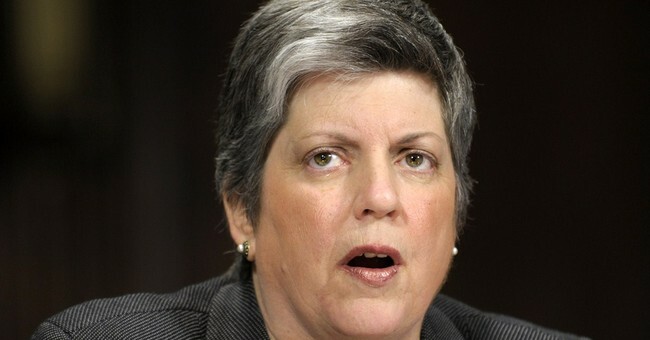 Homeland Security Secretary Janet Napolitano suddenly announced last week that she was resigning her position at the embattled agency in order to take a $750,000-a-year job as president of the University of California system. This will more than triple her salary, which was $200,000 at DHS. The timing of her resignation is highly unusual for a member of the president’s cabinet. Most cabinet members who leave after a president’s first term don’t wait an extra six months into the second term. Many believe she abruptly left DHS because of some sordid dealings that are about to be discovered. Her tenure at DHS has been characterized by back-to-back lawsuits and multiple controversies regarding the agencies DHS oversees, which include the TSA, ICE, U.S. Customs and Border Protection, U.S. Citizen and Immigration Services and FEMA. Napolitano was known in Arizona for her backroom deals and ruthless targeting of conservatives, a pattern she continued as DHS chief. In 2009, she issued a DHS report entitled, "Rightwing [sic] Extremism: Current Economic and Political Climate Fueling Resurgence in Radicalization and Recruitment.” In it, conservatives who prefer local government over federal government, Christians who believe in the “end times,” and single-issue groups, such as groups that oppose abortion and illegal immigration, are singled out and compared to dangerous insurgents, who have “the potential to turn violent.” People concerned about the Second Amendment have “the potential to facilitate criminal activity and violence.” Conservatives are compared to dangerous extremists like the late Timothy McVeigh, who bombed the Oklahoma IRS building. It is claimed in the memo that these types of conservatives have formed their political views because they are racist against blacks and Obama. At the end, readers are urged to report these kinds of people to DHS. Napolitano was tapped by former President Bill Clinton for U.S. attorney after she came to public prominence as an attorney representing Anita Hill against Clarence Thomas at his judicial confirmation hearings, where Hill accused the married Thomas of sexually harassing her. In his book, The Real Anita Hill, David Brock documented how Napolitano put a witness on the stand who wasn’t corroborating Hill’s version of the facts, so Napolitano took her off the stand and had her return and claim amnesia. After leaving the U.S. attorney’s office, Napolitano became state attorney general, where her only memorable accomplishment was banning Christmas decorations from the public areas of the office, which received national attention and protest. Next, as governor of Arizona, she stacked the courts with far left liberals, guaranteeing the outcome of many lawsuits and prosecutions for years down the road. Unlike her moderate Republican predecessors, who appointed a few judges from the Democrat Party, Napolitano appointed almost no Republicans to the bench, and her Democrat appointments have almost all been far left Democrats. As DHS chief, Napolitano failed to secure the borders. During her tenure, DHS implemented a widespread policy of allowing department lawyers to selectively determine which illegal immigrants to pursue for deportation, and which to let go. ICE agents accused her in a lawsuit of failing to properly enforce immigration law over it. Napolitano also enacted a Dream Act-style policy giving young illegal immigrants a reprieve. Arrests of illegal immigrants went up under Napolitano, evidence that more were sneaking across the border. Arrests increased by 13 percent between April 2009 and 2010, according to figures released by Customs and Border Protection. Rep. Jason Chaffetz, R-Utah, criticized Napolitano for not releasing numbers while claiming the border was more secure. “There is no statistic, metric or evidence that the border is more secure than ever. I went out there for a couple days and found multiple spots where you can see trails of people coming in. They were still apprehending massive amounts of drugs out there, this is a very porous border," he said. Nonetheless, Napolitano declared with a straight face in March of 2011 that our border “is better now than it ever has been” and violence has not spilled into the United States. This comes as no surprise to Arizonans, who saw Napolitano veto seven bills as governor aimed at curbing illegal immigration. Known for once saying, “You show me a 50 foot fence, I’ll show you a 51 foot ladder,” she maintained her opposition to border fences while at DHS. Her record on terrorism at DHS has been dismal, as the Boston Marathon Bombers were able to kill three people and injure 264 more during her tenure. Many at DHS believe that Napolitano “checked out” on the agency ever since her stunning comment regarding a terrorist with a bomb aboard a plane in December 2009, where she asserted, "the system worked.” Investigations later revealed gaps in the vetting of airline passengers and security screening overseas. Napolitano also came under criticism for referring to the attempted bombing in Times Square as merely a "one-off." In July 2012, a lawsuit was filed by an ICE employee against Napolitano, alleging discrimination against male staffers within DHS. The suit asserted that two of Napolitano’s top female staffers mistreated male employees, and that promotions were given to women who were friends of Napolitano. Furthermore, the suit alleged, when a complaint was filed with the EEOC, Napolitano launched a series of investigations against the whistleblower. One of the top female staffers eventually resigned, and nothing else appears to have been done. Napolitano spent more time during her tenure at DHS targeting innocent U.S. citizens than protecting Americans from threats, earning her the nickname “Big Sis” from the Drudge Report. DHS started buying up hundreds of millions of rounds of ammunition, making ammunition scarce for Second Amendment-supporting gun owners. DHS claimed it was for ordinary target shooting practice, but much of the ammo consisted of hollow points, ammo that is generally reserved for lethal use since it is more expensive and destructive. She implemented invasive body scans at airports under the Transportation Security Agency, which she forced to retract in May after public outrage. In March, it was discovered that DHS was collecting the private phone and internet records of Americans from telecommunication companies without their knowledge. Sen. Jeff Sessions, R-Ala. sums up Napolitano’s record at DHS the best, "Secretary Napolitano's tenure at the Department of Homeland Security was defined by a consistent disrespect for the rule of law," he said in a statement. Napolitano is an extremist zealot who will stop at nothing to achieve her progressive agenda and stamp out conservatism. The California university system has undergone $1 billion in cuts over the past five years, resulting in tuition hikes, class shortages, furlough days and hiring freezes. Putting someone as disastrous as Napolitano in charge of a system on the verge of collapse should ensure its destruction, or at least turn it into something so politically correct that people make fun of it, such as what has happened to Wellesley College. The University of California school system should be very, very afraid.